Having failed with the trout, today I decided to try for carp. 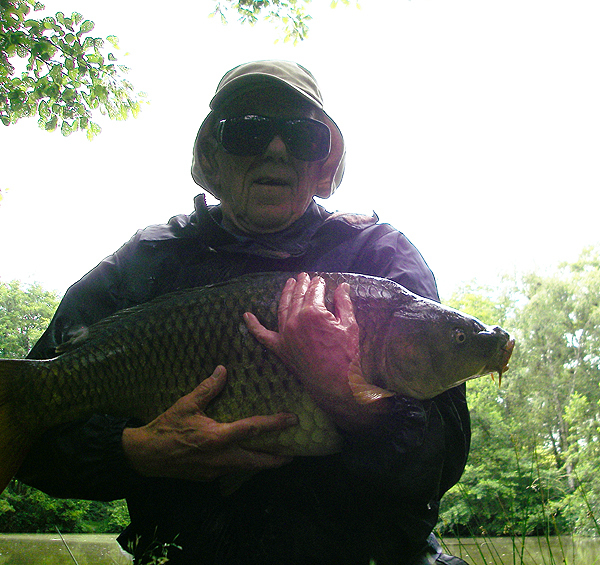 Now it's a while since I fished for carp and last time they were more interested in breeding than taking bait. However, I thought that by now they might be keen to take a crust. I tackled up with my usual gear - bass spinning rod, shimano reel, braided line and a strong size 6 hook. The bait was simply lumps of crust torn from the remains of a small white loaf. My usual approach for this type of fishing is to look for carp activity - shuddering reeds, tenting lilies or ripples close to the bankside - before lobbing my bait in the general direction of the fish and waiting. My first spot was a big bed of flowering water lilies. Almost at once I noticed a few carp moving so I gently lowered the crust into a gap between the floating lily pads. It was no more than five minutes before the leaves shook as a fish moved towards the bait and sucked it in. I grabbed the rod to stop it arrowing into the lake and the clutch began to give line, then everything went slack. The fish had unhooked itself. "Buns!" I muttered and baited up again. 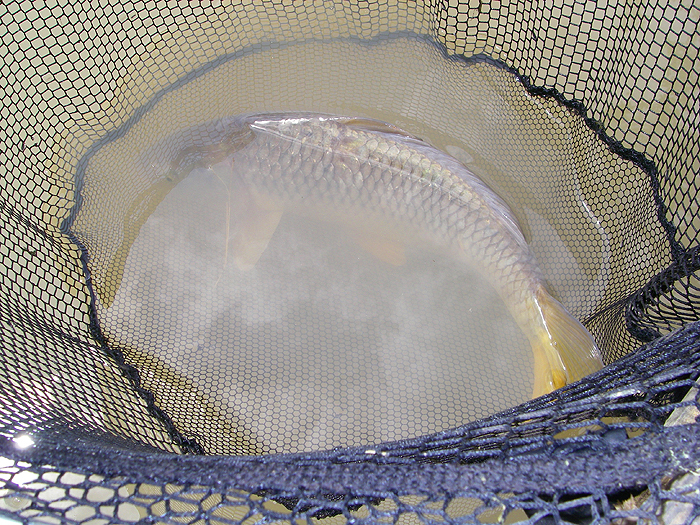 I thought that the plunging carp may not have scared all its mates away and plopped the bait back into the same area. This time it was ten minutes before I had a bite. 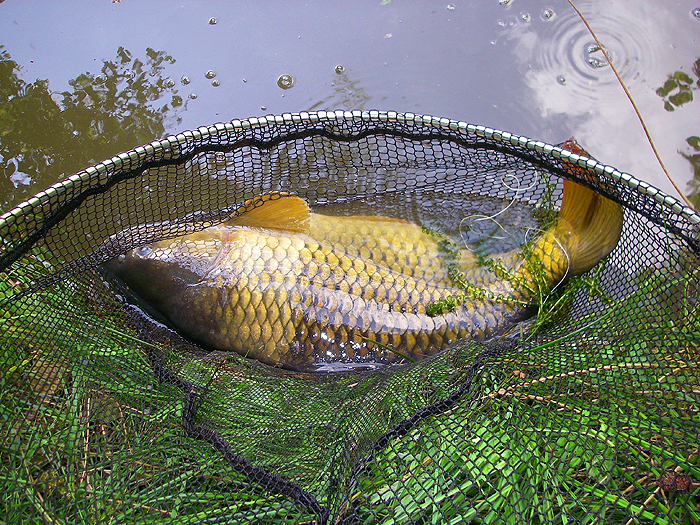 The carp was firmly hooked and before long I had it in the net. No monster but six or seven pounds of battling common. A bit of consolation for the first loss. Now I moved off to another spot - nothing! I walked round the lake looking for signs of life but it was some time before I came to another area of lilies with a hint of movement. I flicked out a crust and waited nothing doing! While I sat I dropped a couple of small crusts into the margin. I sat watching my bait for a while longer but as I waited I noticed some ripples widening from under the bank where I sat. I couldn't see the fish that was feeding but I flicked in another piece of crust and shortly the ripples came again. I reeled in and rebaited before lowering the crust down by the bank. It was actually touching the short grass growing at the water's edge. The rod was placed on the ground with only the tip ring sticking out and just enough line to reach the bait. The wait began again. No more than five minutes passed before I saw ripples close to my bait then the rod jabbed downwards as a fish hooked itself. Line screamed out against the clutch and the carp plunged off into open water. I knew that if I was patient I would be able to land this one. 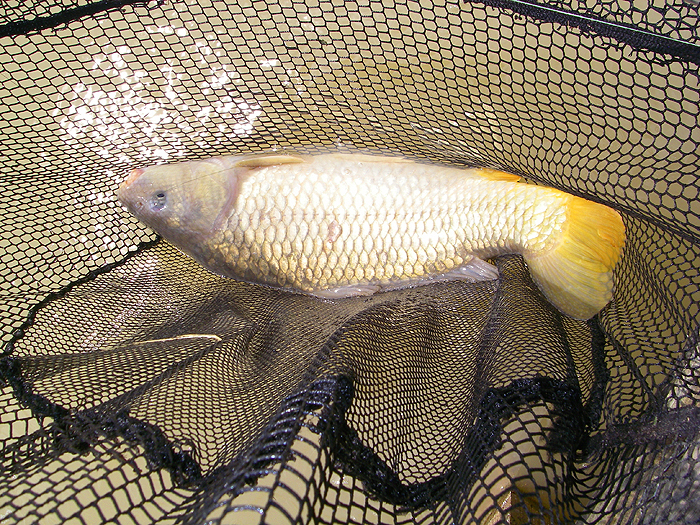 The fight lasted quite a few minutes but eventually a beautiful, golden scaled,common slid into the net. I took a few pictures and weighed the fish. Just over twenty four pounds - fantastic! Of course by the modern standard of carp from stocked lakes and from continental venues this is no monster but in my local waters (and in my book) this is a very good specimen. After that the loss of another modest fish which transferred the hook to a lily stem was anti-climax but I wasn't bothered. I'd almost forgotten how much fun surface fishing for carp can be. Must give it another go.